Uzbekistan. 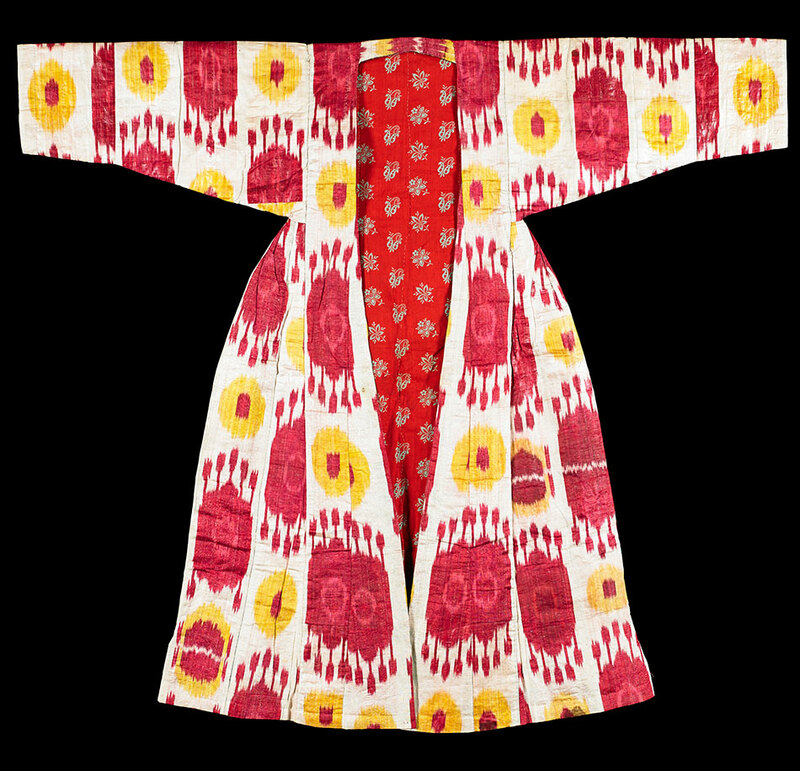 Robe textiles, cotton and silk Ikat robe in red, white, purple and yellow with cotton interior of green and cream floral on brown background. 50 7/8 × 58 3/4 in. (129.2 × 149.2 cm) Loan from the Collection of Peggy Slappey. 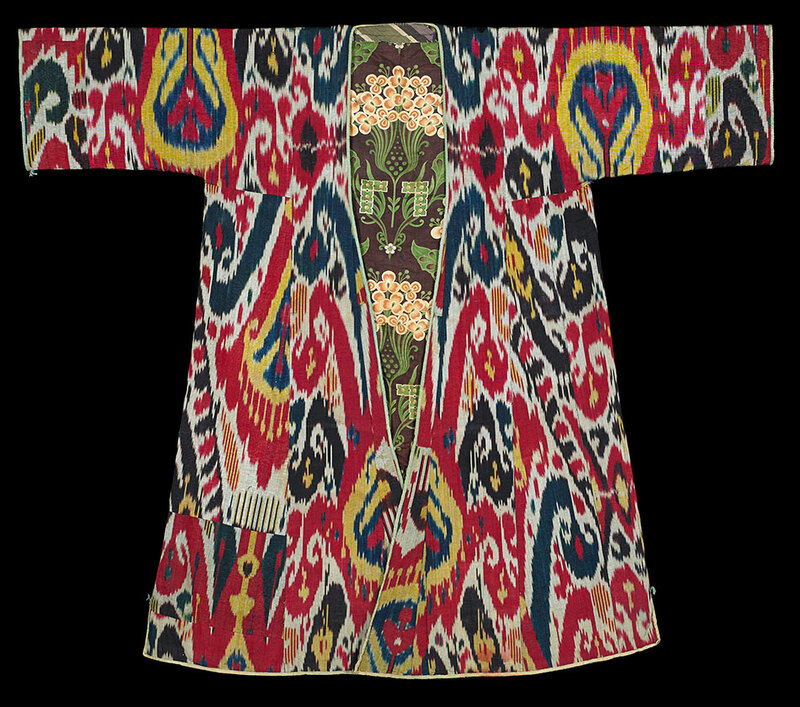 All the Colors of the Rainbow presents a vivid collection of ikat garments created in Uzbekistan in the 19th century, comprising robes, shoes, hats, bags, and even jewelry. For the past decade, ikat patterns have permeated the fashion and design industry, touching everything from clothing and furniture to decorative arts. Despite its recent ubiquity, the ikat tradition has roots that go back centuries and cross many different cultures. Ikat is a complex dyeing technique used to pattern textiles by employing a resist dyeing process similar to tie-dye, and the resulting cloth is often made into garments using a varied combination of colors. The word ikat (pronounced ‘ee-KAHT’) comes from the Malaysian word “menjikat” meaning to tie. The technique developed independently in several parts of the world, namely South America, Japan, Indonesia, India, and western Central Asia. Central Asia, Uzbekistan. 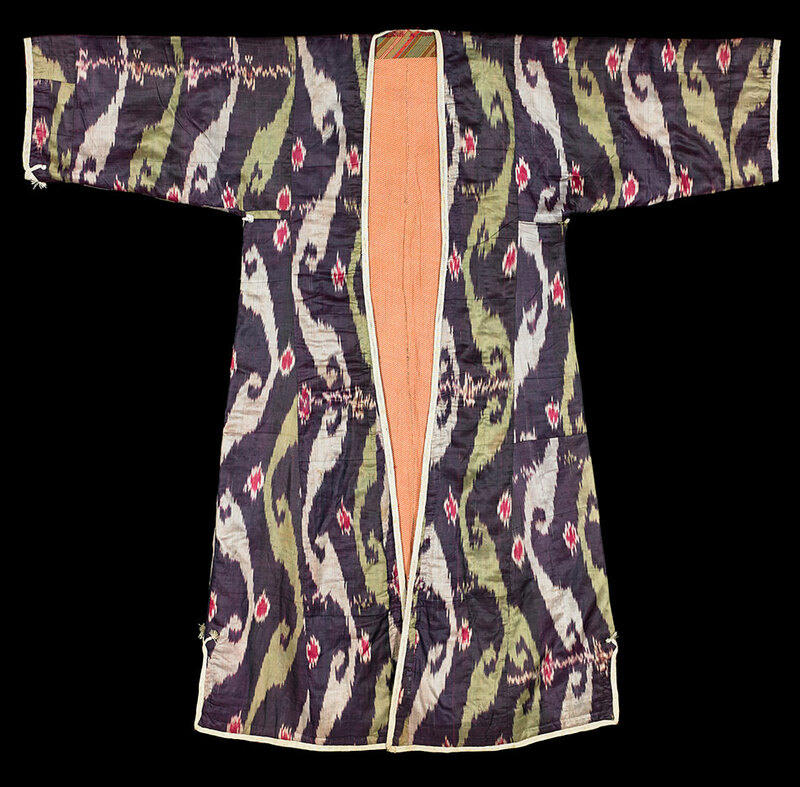 Robe (Munisak), latter half of 19th c. Ikatdyed, silk or cotton. Construction: Single panel of yardage down the back. Materials for ikat: warp, silk; weft, silk (warp ikat) Lining: Russian roller printed cottonlate 20th c. Attached with variegated ikat warp thread. Edge finish: commercial/machine made 20th c. Facing: ikatcut on diagonal, 53 1/2 × 64 5/8 in. (135.9 × 164.1 cm) Loan from the Collection of Peggy Slappey. Modern Uzbekistan includes many of the great cities of the ancient Silk Road and has been an important crossroad for trade for centuries. The very term “Silk Road” defines one of the principle goods carried through Central Asia from China to the Mediterranean Sea. Used as currency and a luxury good, literally millions of bolts of silk changed hands over the centuries. Relatively lightweight, easy to transport, and aesthetically desirable, silk was a staple product of trade. The making of many Uzbekistan ikat begins with the production of silk. Women raised silk worms that were then sold in the bazaars to men, who in turn unwound them into thread that was then dyed and finally woven into cloth. Historically, clothing represented rank and status in the oasis communities. The wealthiest residents wore costly, bright silk ikats, while those in lesser positions wore similar robes made of cotton. 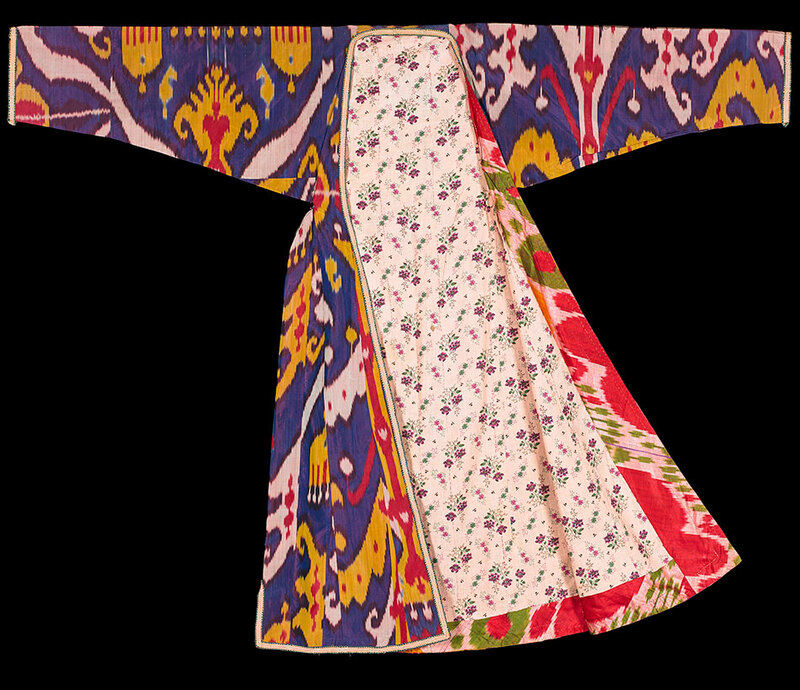 The ikat robes produced in Uzbekistan in the 19th century came in a wide spectrum of vibrant colors and were used as clothing, decoration, and gifts. 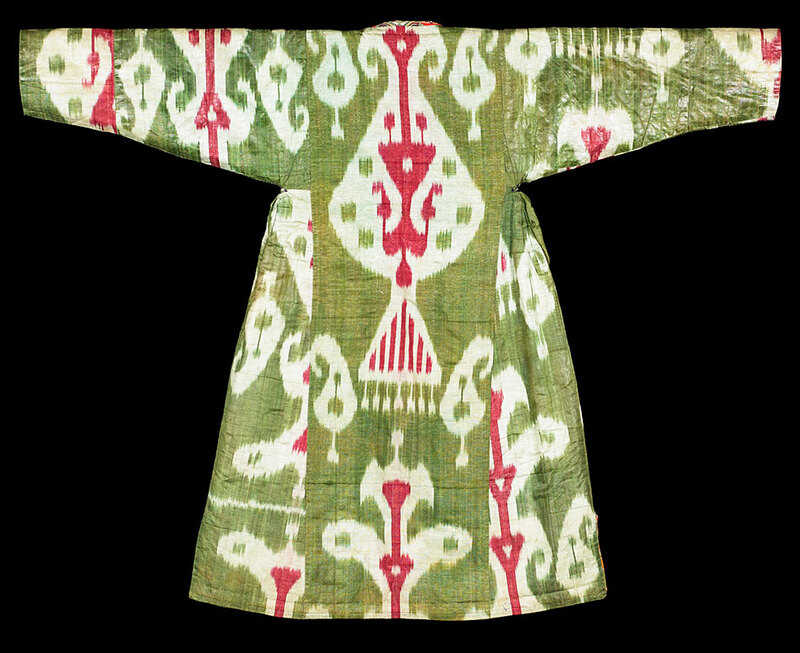 Uzbekistan, Robe Ikatdyed, silk or cotton, 50 1/4 × 63 1/2 in. (127.6 × 161.3 cm) Loan from the Collection of Peggy Slappey. 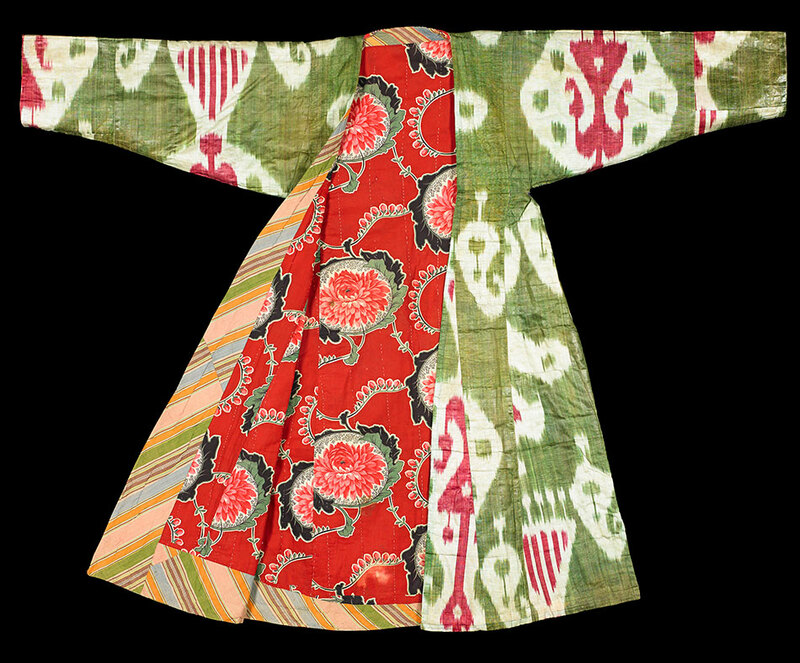 Central Asia, Uzbekistan, Robe (Chapan), latter half of 19th c. Ikatdyed silk or cotton . Construction: Single panel of yardage down the back. Materials for ikat: warp, (possibly glazed) silk; weft, (possibly glazed) silk. Lining: Russian roller printed cotton and handspun and handwoven cotton. Edge finish: loop manipulated (handmade) Facing: ikat on diagonal 50 3/8 × 52 3/8 in. (128 × 133 cm) Loan from the Collection of Peggy Slappey. 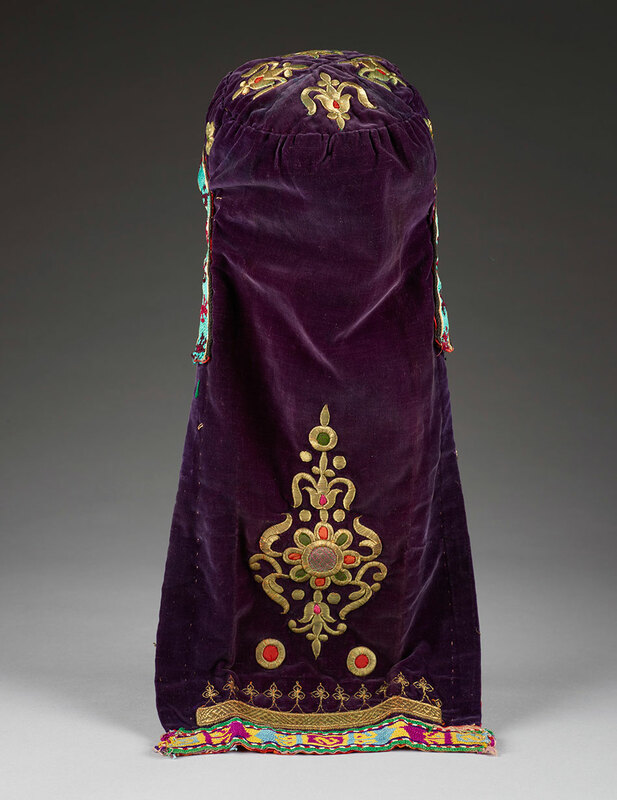 Central Asia, Uzbekistan, Robe (Munisak), latter half of 19th c. Ikatdyed silk or cotton. Construction: Single panel of yardage down the back. Materials for ikat: warp, silk; weft, silk (warp ikat) Lining: Russian roller printed cottonlate 20th c. Attached with variegated ikat warp thread. Edge finish: commercial/machine made20th c. Facing: ikatcut on diagonal, 53 1/2 × 64 5/8 in. (135.9 × 164.1 cm) Loan from the Collection of Peggy Slappey. 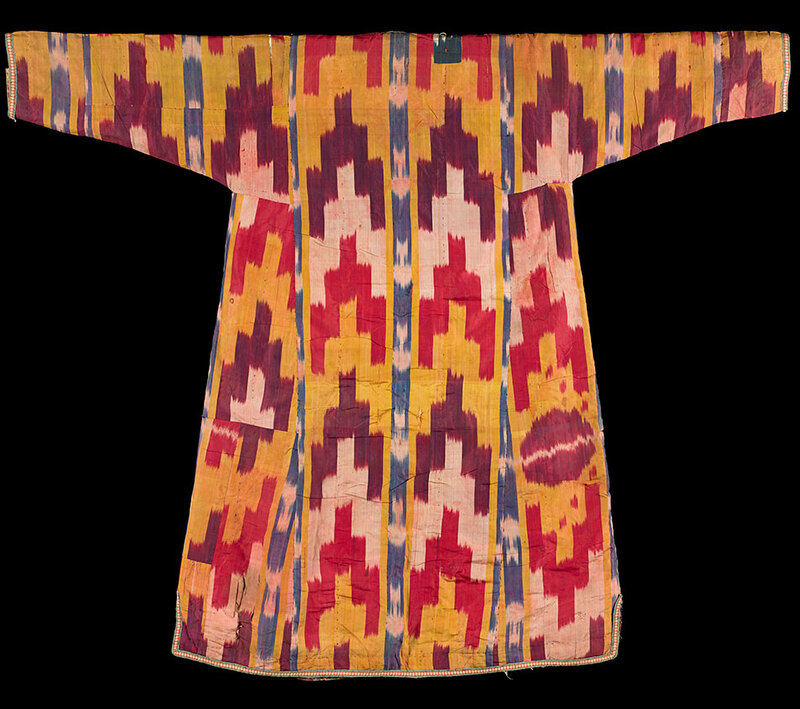 Central Asia, Uzbekistan, Robe (Chapan), latter half of 19th c. Ikatdyed silk or cotton. Construction: Single panel of yardage down the back. Materials for ikat: warp, silk; weft, silk. Lining: various Russian roller printed (very late 19th c. print in sleeves) Edge finish: machine made trim applied with running stitch. Facing: diagonal woven stripe on front, ikat on bottom, 50 1/4 × 59 5/8 in. (127.6 × 151.4 cm) Loan from the Collection of Peggy Slappey. 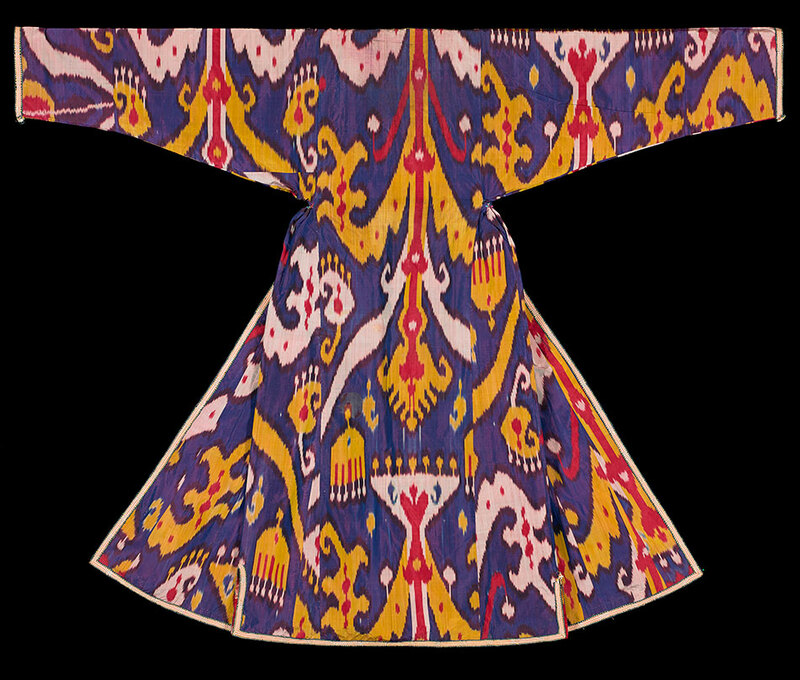 Uzbekistan, Robe Ikatdyed, silk or cotton, 53 × 56 7/8 in. (134.6 × 144.5 cm) Loan from the Collection of Peggy Slappey. 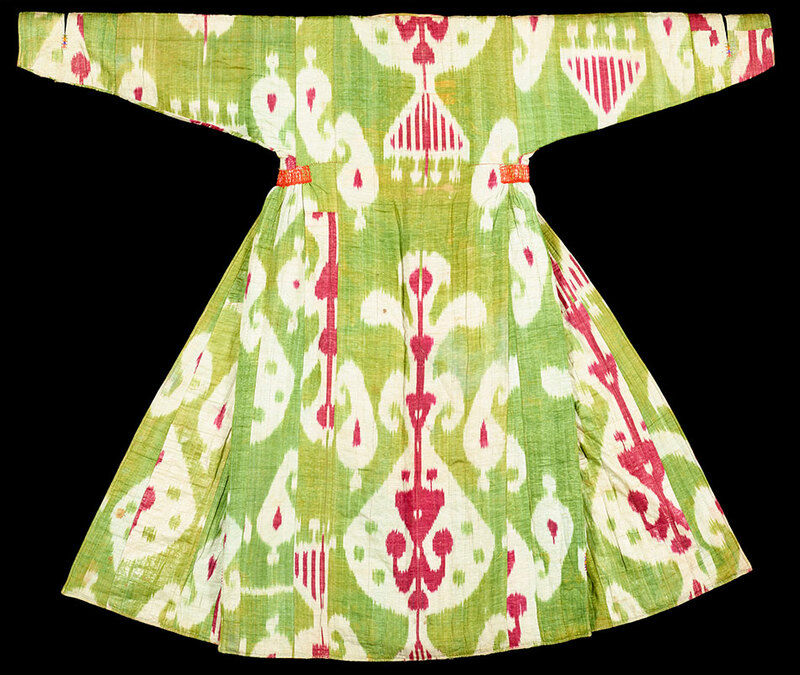 Uzbekistan, Robe ikatdyed, silk or cotton green. Costume: 58 × 49 in. (147.3 × 124.5 cm) Loan from the collection of Peggy Slappey. 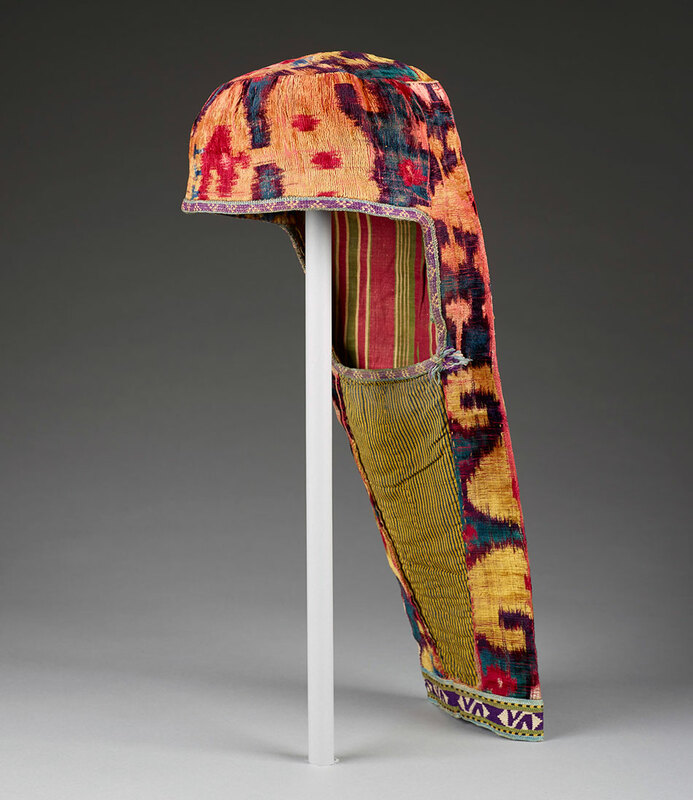 Uzbekistan, Hat Ikatdyed, silk velvet. Construction: Single panel of yardage down the back. Materials for ikat: warp, silk; weft, silk. Lining: block printed homespun, 19 1/4 × 7 1/8 in. (48.9 × 18.1 cm) Loan from the Collection of Peggy Slappey 68.2013. Uzbekistan Hat. 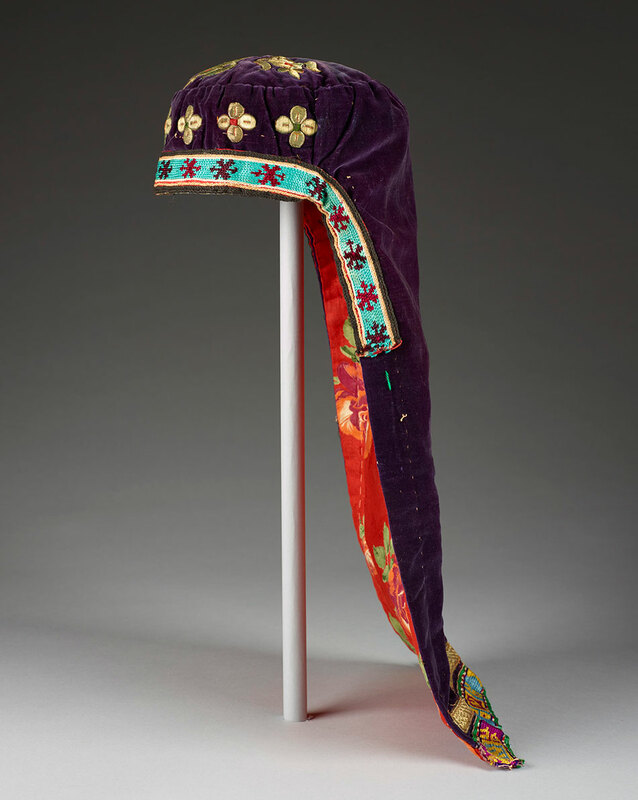 Textiles: velvet, metallic embroidery thread, and knitted ribbon purple velvet hat with train, with gold embroidery and knitted ribbon edging, 19 7/8 × 9 1/2 in. Diam. (50.5 × 24.1 cm) Loan from the Collection of Peggy Slappey. 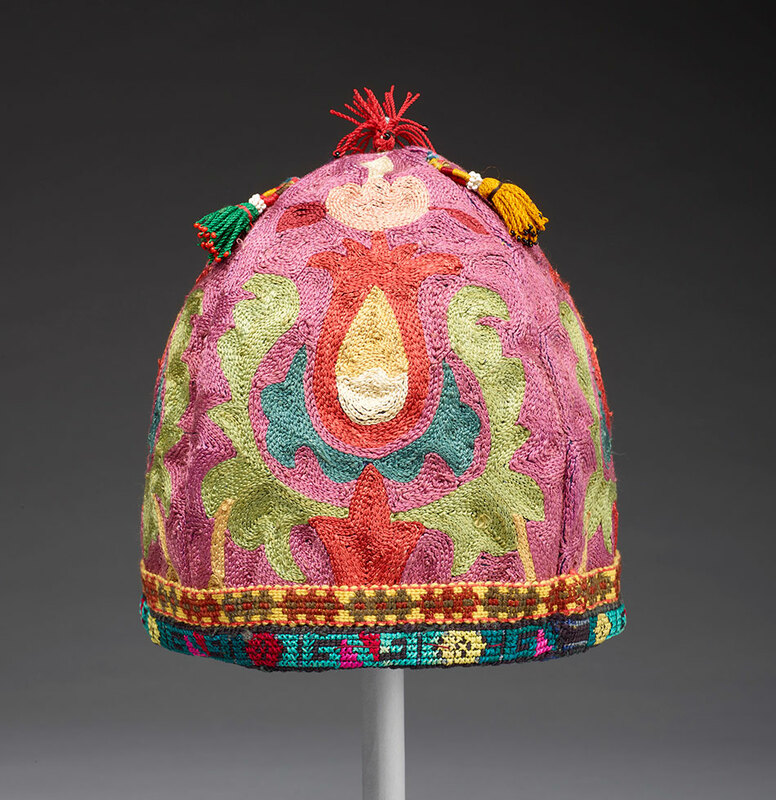 Uzbekistan, Hat ikatdyed, silk or cotton embroidered, pink. Loan from the collection of Peggy Slappey. 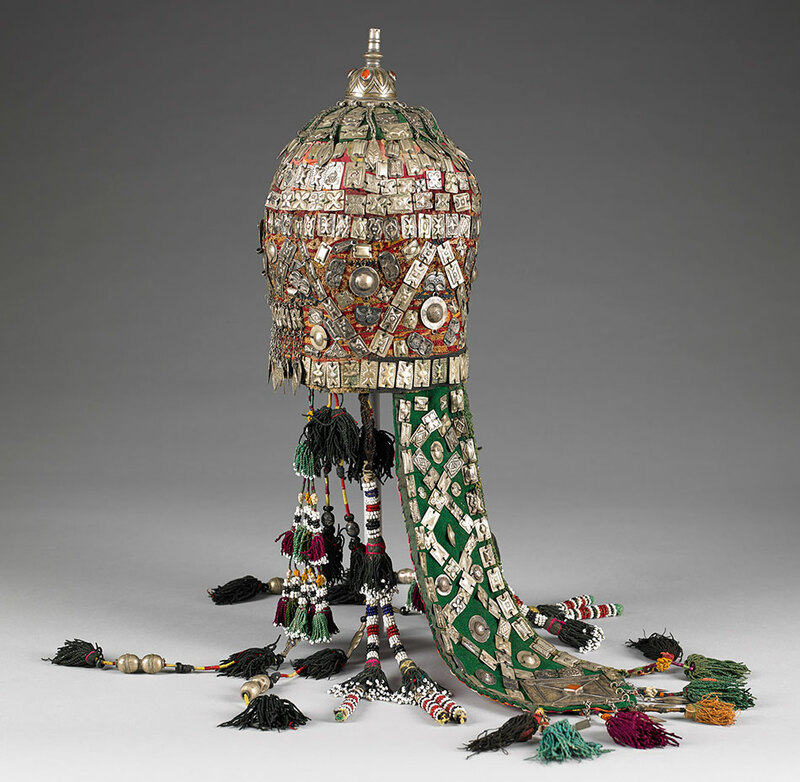 Uzbekistan Crown, cotton or silk and metal, 12 3/4 × 7 1/2 in. Diam. (32.4 × 19.1 cm) Length with tassels: 32 1/2 in. (82.6 cm) Loan from the Collection of Peggy Slappey. 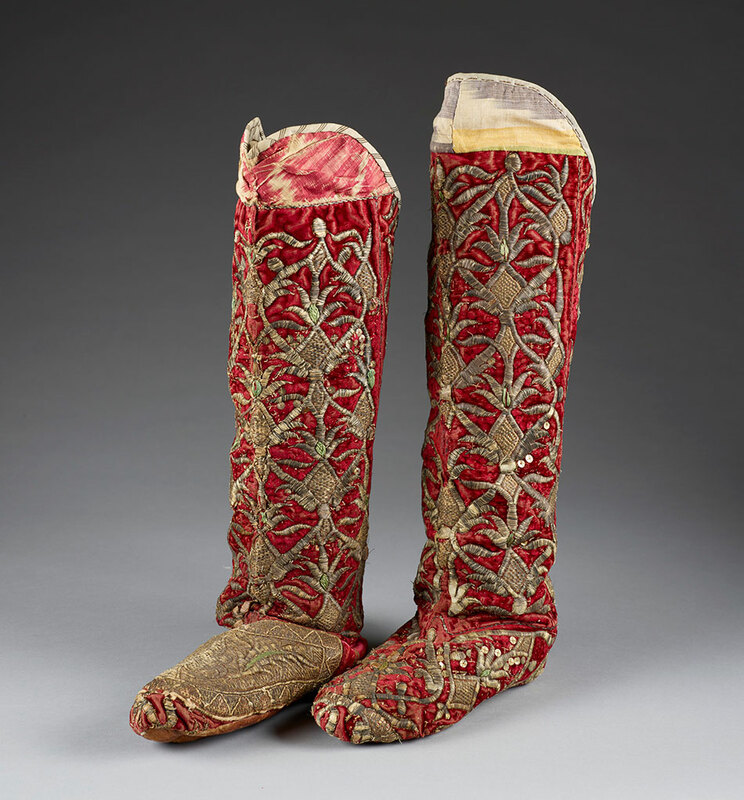 Uzbekistan, Pair of Boots, textiles, leather, metallic embroidery thread. Loan from the Collection of Peggy Slappey. 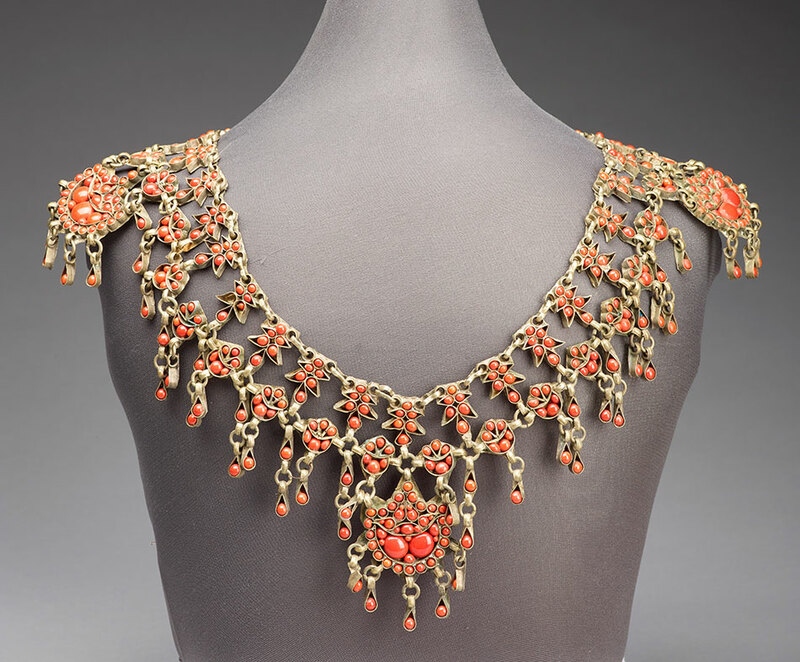 Uzbekistan, Necklace, silver, coral orange coral and silver. Loan from the collection of Peggy Slappey. 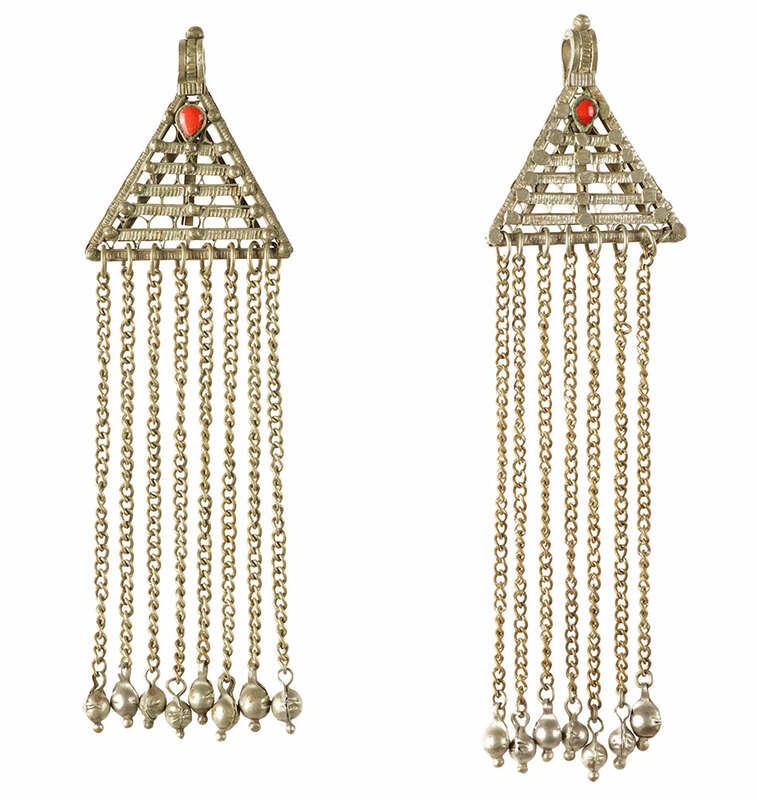 Turkmenistan, Pair of Earrings, silver and coral. Loan from the collection of Peggy Slappey. Though the Birmingham Museum of Art has hosted and originated many exhibitions concerning various aspects of Asian art over the years, this is the first to feature pieces from Central Asia. 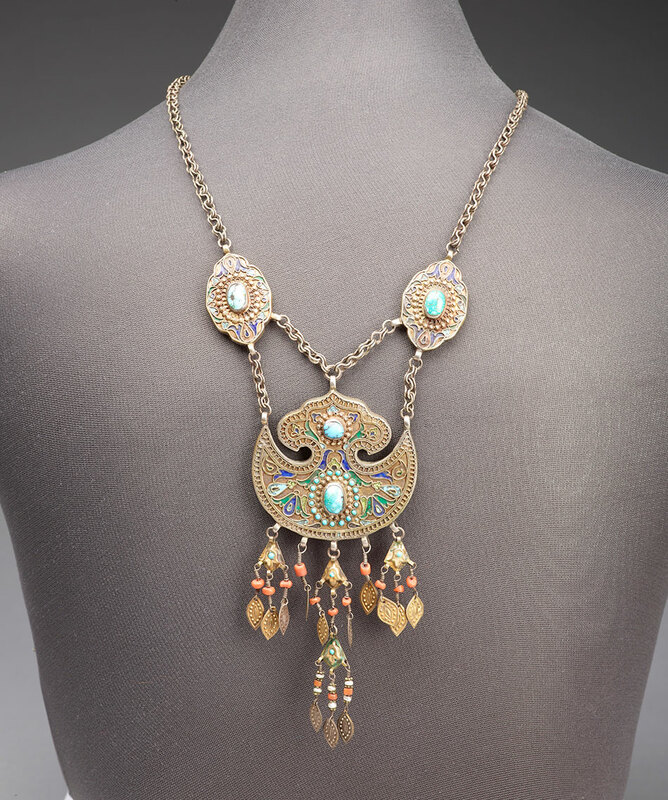 The Museum expand its horizons and present these wonderful Uzbekistan treasures from the collection of Peggy Slappey. All the Colors of the Rainbow: Uzbekistan Ikats from the Collection of Peggy Slappey has been made possible by grants from the Robert R. Meyer Foundation, the E. Rhodes and Leona B. Carpenter Foundation, The Lydia Eustis Rogers Fund, the Alabama State Council on the Arts and the National Endowment for the Arts, and support from the City of Birmingham.